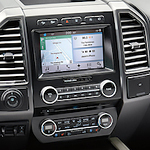 Ford Expedition: Capability Features You Need | Milnes Ford Inc. The Ford Expedition is one of America's favorite full-size SUVs because it has the ability and power to haul people and stuff and take you wherever you wish to go in a variety of terrains. For your next off-road adventure, look no further than Ford Expedition's FX4 Off-road Package. This option has everything you need including a heavy-duty radiator, underbody fuel tank protection, 18-inch magnetic metallic-painted cast-aluminum wheels, skid plates, and much more. Need lots of cargo space? Ford Expedition has it. In making adjustments to second and third-row seating, you have up to 121.5 cubic feet of space for all of your stuff. Want a closer look? Visit our Ford showroom and take Ford Expedition for a test drive. We'll set you up behind the wheel and answer all of your questions about this exciting SUV.